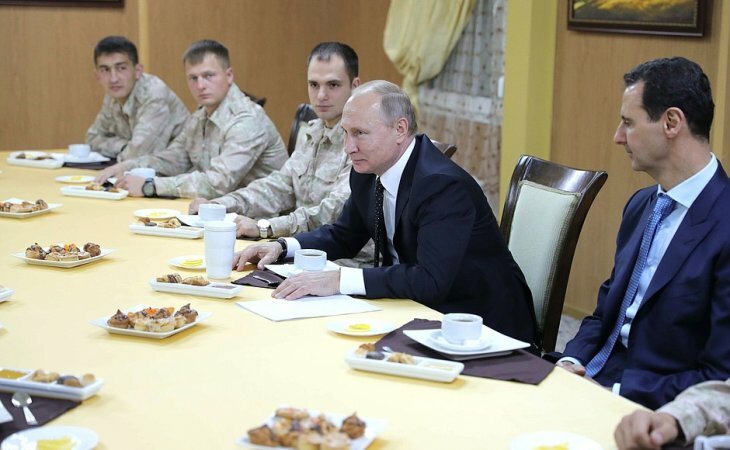 Putin meets with al-Assad on the Russian air base. The annual presidential address to the parliament is usually a rather dull affair in Russia, but President Putin has certainly managed to make an impression with the speech delivered on March 1, 2018. He elaborated at great length about Russia’s military might, but before describing new weapon systems (some of them entirely phantasmagorical), he briefly mentioned that the Syrian operation had shown increased capabilities of the Russian Armed Forces. This is a change of tone from yet another declaration of “victory”, and indeed, Syria constitutes a paradox in Russia’s relations with the USA as Moscow seeks simultaneously to maintain military cooperation and defeat presumed U.S. political intentions in this messy conflict. This odd pattern was tested on February 7, when a heavy U.S. air and artillery strike destroyed a grouping of pro-government forces advancing to capture an oil plant to the east of the Euphrates. Russian social networks exploded with rumors about hundreds of casualties among mercenaries from the so-called “Wagner group,” and a few cases were reliably confirmed. The official position, however, remains complete denial of the first major direct clash between Russian and U.S. forces in Syria, which allows Moscow to act as if there’s been no damage in relations. The pattern of tensions between the regular Russian Armed Forces in Syria and Wagner’s soldiers of fortune indicates that while the latter received the bulk of its armaments and supplies from the former, the money, which is the lifeblood of the mercenary business, was not coming from the defense ministry budget (Novaya Gazeta, January 22). The Russian military top brass has blocked legislation in the State Duma that would have legitimized private security contractors like Wagner Group. Moreover, Russian commanders have disavowed any responsibility for the failed “unauthorized attack” of a battalion group comprised of Wagner warriors, which was devastatingly routed by US air and artillery strikes (New Times, February 19). The responsibility for launching the attack and indeed for sponsoring the deployment of Russian mercenaries is placed on a particularly sleazy character among the Russian oligarchs. For more on this denial of responsibility, check “New Russian question: Who is Mr Prigozhin?”, Eurasia Daily Monitor, February 26, 2018. Useful as it may be to pretend that the war business in Syria goes as usual, Moscow can hardly hope that its eroded positions would go unnoticed by the antagonists who are busy advancing theirs. Russia still has important assets in Syria and is exploiting the confusion in U.S. policy around the Iraq/Syria war zone. Its own policy, however, is distorted by a series of new challenges, which test its staying power. Putin thought that he figured out a proper balance of key drivers in the convoluted war, but its new mutation has caught him unprepared. The space for maneuvering between regional adversaries is narrowing, and Moscow can neither take sides nor secure its own ground. Read more on this predicament in “Russia stumbles in the fog of Syrian war”, Order from Chaos, Brookings, February 21, 2018.